No mention is made of Calabazas in the historical record until November of 1756, when Father Francisco Pauer, the Jesuit minister at Guevavi, relocated seventy-eight O'odham neophytes from their village of Toacuquita to this new location. It lies between Guevavi and Tumacácori on a bluff on the east side of the Santa Cruz River just upstream from its junction with Sonoita Creek. Since San Cayetano de Tumacácori was by then San José de Tumacácori, there was good reason Las Calabazas should be awarded the patronage of Saint Cajetan (San Cayetano), the 1524 co-founder of the Theatine Clerks Regular, a strict religious order whose members modelled their lives on those of the Apostles. Cayetano—whose carved wooden likeness, which may once have been at Calabazas, can now be seen in the museum in the visitors’ center at the Tumacácori unit of Tumacácori National Historical Park—was canonized in 1671, just twenty years before Father Kino bestowed his name originally on Tumacácori. Calabazas possessed neither church nor cemetery in January of 1760, but by May of 1761 the minister of its cabecera at Guevavi wrote of Calabazas that it had “a new house with door and lock. The church I leave (to my successor) nearly half built,” suggesting it was still roofless. The edifice had to await the arrival of Franciscans who managed to complete the flat-roofed adobe building in 1772 or 1773, just about the time they moved their headquarters from Guevavi to Tumacácori. It wasn’t long before the new church was christened in battle. A group of Apaches, apostate O’odham, and Seris—possibly some of the same men who had attacked Magdalena and other Pimería Alta communities the previous year—swooped down on Calabazas in 1777. “They sacked and set fire to it, burning all the houses, the church, and the granary with more than a hundred fanegas of maize. The mission Indians put up a stiff defense killing thirteen of the enemy at a cost of seven of ours gravely wounded with little hope of survival. Gente de razón (people of reason)—non-Indians and Christian Indians not living in mission communities—moved into the Santa Cruz valley in growing numbers in the early decades of the nineteenth century. By 1808, several such families had moved into Calabazas, and this in spite of the fact that in 1807 the title to Calabazas lands had been awarded to the Tumacácori O’odham. The settlers must have fixed up the Calabazas chapel given the fact that in 1818, it provided the location for a wedding. However, permanent tranquility was not to be. Apaches attacked the place in 1830 and “set fire to its buildings and chapel, carrying off all the sacred vessels and vestments from the latter.” While cowboys from Tumacácori continued to run cattle in the vicinity, the 1830 attack discouraged anyone from living there for more than the next two decades. In 1844, Calabazas was sold at auction to the brother-in-law of sometimes Sonoran governor Manuel María Gándara. In 1852, Gándara struck a deal with three Germans and a Frenchman to operate the Calabazas ranch. The Frenchman and one of the Germans moved in, and by April of 1853 they seem to have repaired the old adobe church and converted it into their living quarters. They also added a long rectangular dormitory on the north to house workers and their families. Calabazas, like the lands of Guevavi and Tumacácori, became part of the United States with ratification of the Gadsden Purchase in June 1854. Mexican soldiers, who had remained in Tucson to protect the citizens from Apaches, withdrew from the Gadsden Purchase territory early in 1856 and the Gándara ranch came to an end. The ranch house which was the old Jesuit church, however, was due for re-use. Late in 1856, it became the temporary home of Major Enoch Steen, commander of four companies of the First Regiment of United States Dragoons who established Camp Moore at Calabazas as the first military post in the New Mexico Territory’s Gadsden Purchase area (which in 1863, became the southern portion of the newly created Arizona Territory). Steen moved Camp Moore to Sonoita Creek in 1857, but his house, the former chapel, was taken over by the United States Deputy Collector of the Revenue for New Mexico whose job it was to collect duty on goods coming into the United States from adjacent Mexico. 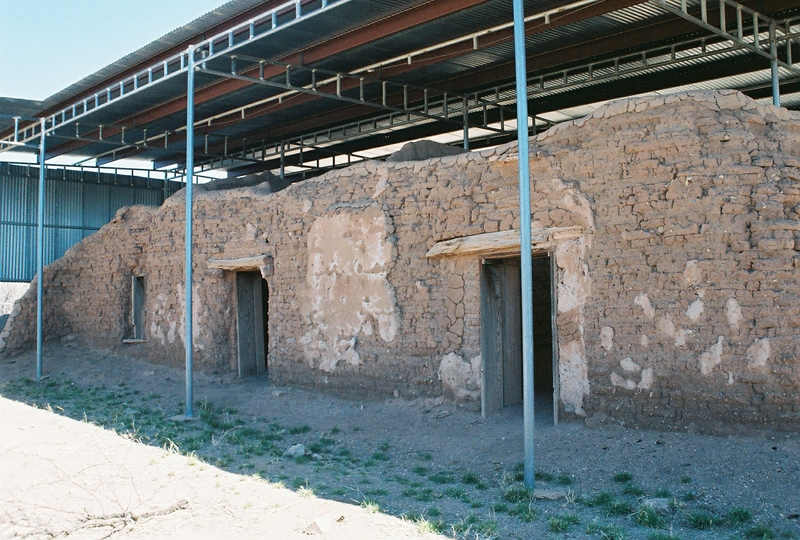 Following the departure of the Collector of the Revenue from Calabazas, it is possible, although by no means certain, the adobe was used as a temporary dwelling for at least four or five more families and once may have housed the local post office. What does seem certain, though, is that by 1878 the old church of San Cayetano de Calabazas had given up the ghost with nothing remaining except its roofless shell, a small part of which is now protected as the Calabazas unit of Tumacácori National Historical Park.